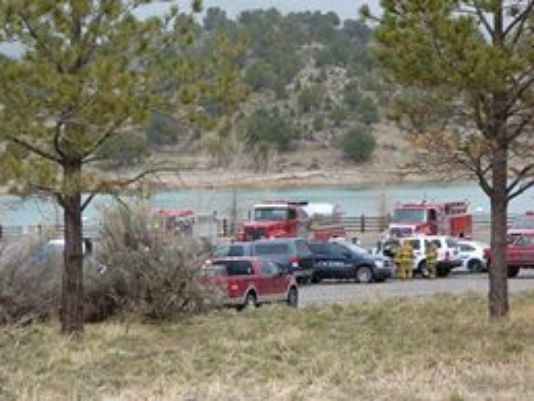 A small plane crashed into a reservoir in southwestern Colorado. The aircraft is believed to be carrying five people and authorities say they don’t think anyone survived. The single-engine Socata TBM700 was flying from Bartlesville, Oklahoma, to Montrose, Colorado, about 180 miles southwest of Denver, when it went down Saturday, Ouray County spokeswoman Marti Whitmore said. Federal Aviation Administration spokesman Ian Gregor said the crash occurred just before 2 p.m., but he didn’t yet know its cause. The aircraft went down in Ridgway Reservoir, about 25 miles south of Montrose. Rescue efforts started in the afternoon and were suspected shortly after sundown until Sunday morning, Marti Whitmore said. Marti Whitmore said no one is believed to have survived, but no victims have been recovered. She said the aircraft crashed about 90 ft from shore in 60 to 90 ft of water. The identities of the occupants were being withheld until relatives could be notified. The plane is registered to an Alabama corporation. Marti Whitmore said recovery work will continue Sunday. The Ouray County sheriff’s office said a dive team and additional resources were expected to take part. Colorado State Parks has closed a nearby campground and day facilities, pending completion of the recovery efforts.